Italy is up there with one of our favourite places to visit. From the food to the people, the sites and the atmosphere it is the one place we will always return. That is why over the next few weeks we will be concentrating on producing our Italy Series and sharing all our recommendations and top tips with you. Milan is the perfect weekend getaway, you can fly on the Friday night and return on the Sunday evening without feeling as though you’ve had to rush around or miss anything out. Plus, you manage to save those all important holiday days! We landed in Bergamo Airport around 11:30pm on the Friday evening and jumped on a coach to Milan Central Station. The coach takes around 50 minutes and only costs 5 Euros each way! There are three different companies that run the service, yet all are the same price so we’d suggest jumping on the first non-stop coach as soon as you arrive. We asked about getting a taxi and literally everyone laughed in our face – clearly the coach is the done thing. Once we reached Milan Central Station it was only a 10 minute walk to our hotel. We stayed at the Felice Casati Hotel, part of the best western group. It was a great location with spacious and comfy rooms. As we’d arrived late we decided to hit the sack to be refreshed for our first day of exploring. Our first stop was the Duomo di Milano, a stunning cathedral in the centre of Milan. From the intricate facade, beautiful interiors and amazing view from the terraces, it is a must see. We’d suggest pre-booking tickets and getting there early, as it tends to get busy fast and buying tickets on the day is hassle you’ll want to avoid – believe us! Who still does number stumps!? After the Duomo we walked around the Galleria Vittorio Emanuele II shopping centre situated just next door. It’s Italy’s oldest shopping centre and we have to say it is absolutely stunning! Housing the fashion industries biggest names from Prada to Versace it’s well worth a visit – even if you’re only window shopping! Now, after a lot of exploring we began to feel rather peckish and as we were in Italy there was only one thing we wanted… Gelato! We’d been recommended Cioccolatitliani and it didn’t disappoint – literally not even a little bit. Located just around the corner from the shopping centre it’s the perfect place to pick up a sweet treat. Whether you prefer chocolate or something fruity Cioccolatitliani has a range of Gelato combinations to choose from. Our favourite was The Happy Cone with chocolate, vanilla and salted caramel gelato, topped with a wafer and Nutella, PLUS melted chocolate in the cone! Hands down one of the best ice creams we’ve ever had – sorry Florence! To complete the afternoon we walked over to the Navigli District, also known as ‘true Milan’. The Navigli District is the perfect place to relax, you can walk up and down the canals and grab an outside table in one of the many bars and restaurants along the way. We stayed until after sunset sampling the finest red wine (to our knowledge), eating Carbonara and watching the world go by. Afterwards we headed to Morgante for some G&Ts and sat in the beautiful garden chatting to the locals till the early hours. After another hearty breakfast (which we needed we’re not going to lie) we headed to Sforza Castle and Sempione Park for a lovely morning walk. Sforza Castle is a beautiful building built in the 15th century by Francesco Sforza, Duke of Milan. It houses artworks from great artists such as Leonardo da Vinci and Michelangelo’s the Rondanini Pietà. Just behind the castle in Sempione Park, here you will find locals working out, walking their dogs or feeding the ducks. The park is a great place to relax, as well as seeing Milan’s Porta Sempione or ‘Arch of Peace’ located at the far end. A perfect way to spend a Sunday morning. Then we headed back towards the centre of Milan to have one last meal before heading back to the airport. We tucked into bruschetta, burrata, pasta and pizza, it was absolutely delicious and definitely enough to keep us going. 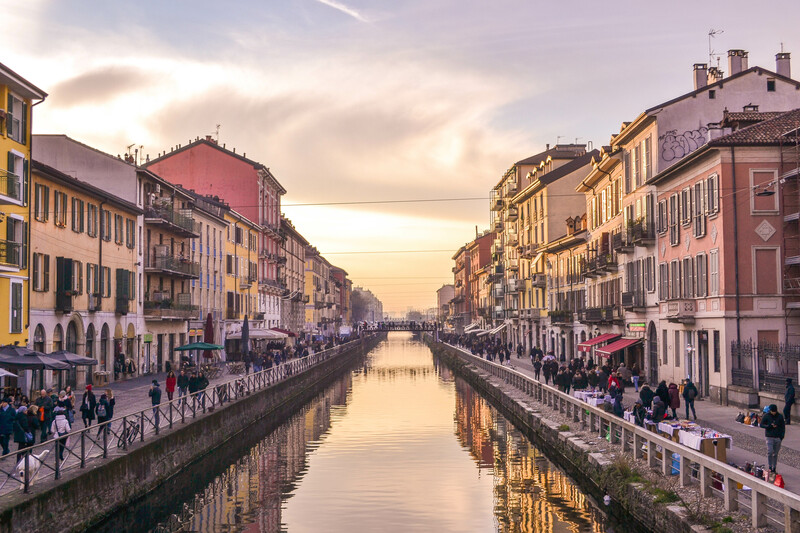 However, if you’re looking for a cheap meal we’d suggest heading back to the Navigli District rather than near theDuomo di Milano as prices are much cheaper! With one last look at the Duomo and another trip to Cioccolatitliani – this time we went more extravagant with a cone including caramel brittle! We headed back to our hotel to pick up ours bags and then walked to Milan Central Station to grab a coach to the airport. The coaches leave every 5 minutes from the station so you don’t need to worry about missing one. Da Vinci’s Last Supper – As art lovers we were really eager to see The Last Supper painting at the Santa Maria delle Grazie, unfortunately as we arrived to buy our tickets we were informed that the gallery was booked up for FIVE days! Therefore, if you would like to see The Last Supper make sure you book your tickets well in advance – maybe even as soon as you’ve booked your flights. Bad, bad, bad pre-planning! Aperol Terrace – Next to the Duomo you will find the Aperol Terrace which provides stunning views over the cathedral and surrounding square. If you can get a table on the terrace then you’re winning! However, there was a queue as we arrived with an uncertain wait time and we needed wine urgently, so we’d suggest aiming to go at less popular time – were guessing the only time is 9:00 on a Monday morning. Italy is so lovely! There is such a mystical vibe there that make us fall in love. We’ll be heading there this summer, can’t wait!